Pure and gentle, WaterWipes contain no chemical ingredients. Suitable even for newborn babies, Water wipes are just as pure as cotton wool and cool boiled water but much more convenient to use. 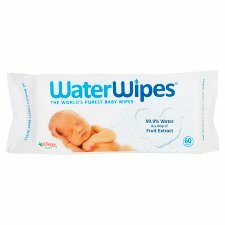 Supplied in a pack of 60, WaterWipes help to prevent nappy rash and will not irritate even the most sensitive skin types.